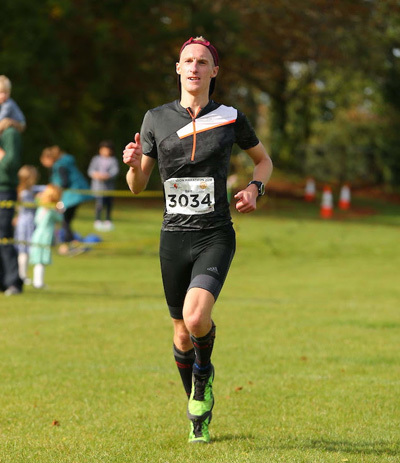 Ben Pitman won the Clarendon Marathon in 2018, 1st male , 2 hours & 54 minutes. Read his story. I don’t know about you but I love running from point to point. Maybe it’s the ever changing scenery or possibly the fact that you have to keep going in order to get your final destination that appeals to me. There’s something about the achievement of getting from one place to another, rather than returning to your starting point, that fascinates me (even if I am a person who can be found running around a track regularly). Our route takes you from Salisbury to Winchester along the ancient Clarendon Way with a few extra turns here and there to make up a full 26.2 miles. More than 90% is off road, with the trail following country tracks and paths – many of which have not changed since being travelled by the ancient Kings and Queens of England. 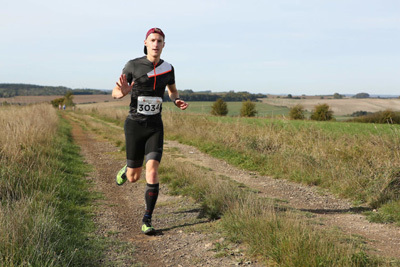 A perfect event for me and something I’d wanted to enter after running along the length of the Clarendon Way (on what turned out to be a rather muddy and gloomy day) in the build up to my 50km race late last year. However to be truly honest with you I had intended to run a flat, fast Abingdon last Autumn but when I finally got around to enter the thing it had sold out. Bugger. Nevertheless the silver lining was I could have a run out between the Wessex cities instead. The weather had been somewhat kind to those of us running on the Sunday. Despite persistent showers on the Saturday, the following morning was much better; a cool, clear day, the sun glowing up ahead as the route ran ever eastward. I arrived in Salisbury plenty of time before race start (having taken one of the buses Winchester Rotary had organised to ferry runners from start to finish and visa versa) giving me time to get my number and chat to fellow runners, many who were running the marathon as part of a separate 4 person relay starting at the same time. Coming into the final few days before the race I’d been plagued by a particularly tight right calf that just refused to loosen off. I was a bit worried that it was going to hamper my run (as my calves tend to tighten up on longer races) but on the morning of race day they felt OK. As a bit of an insurance policy I wore my calf sleeves, giving me a little bit of support and undoubtedly some mental reassurance. Expectations in terms of time were to be in under the 3 hour mark; the course looked good (softened up by the previous day’s rain but not muddy) and my fitness was clear but if the calf was really playing up and really slowing me down I would drop at one of the changeovers and get myself back to Winchester with some of the runners on the relay rather than struggling on. 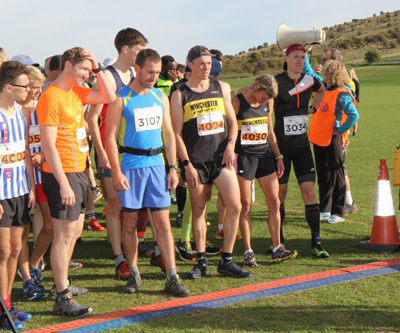 A rather odd mix of confidence and concern going to the start line but I was there, I would run and deal with whatever came my way. Off we went from Wyvern College, marathon runners interspersed with those running the first leg of the relay. Through the first mile I let the earnest relay runners (and some over-eager marathoners) go off ahead, keeping to a steady 6 min mile pace which I’d come accustomed to when training for the distance in the build up. 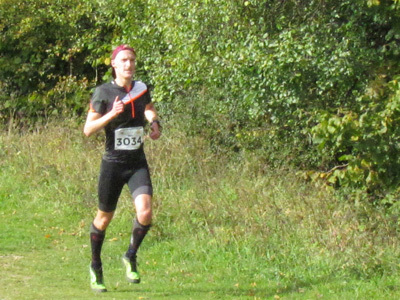 Over the next mile or so, as the route headed onto the trails and up a short hill towards Clarendon Palace I passed the few marathon runners ahead and picked my way through the relay teams until I reached the leading relay runner. I felt good going up that first hill; controlled, strong and not feeling any tightness in my calf. Into the woods I held position, following a junior from Andover at the front, not needing to push as I was still early doors and finding my rhythm on the off road surface. A novel inclusion in this race are the mile markers which count down the distance to the finish. It’s quite a good idea, although during the early stages of the marathon spotting a 23 miles to go sign isn’t always the best thing to see, and a little getting used to as well as my watch’s mile split beep was naturally 0.2 miles out of sync with the ‘mile to go’ signs. Through the village of Pitton, as I moved ahead of the junior from Andover, the Winchester relay team took over the both of us giving me someone else to follow up the next hill. Through the next couple of miles we built up a bit of a buffer to the next runners. 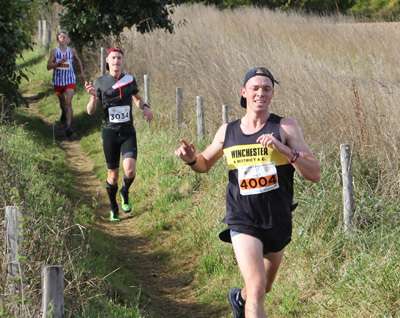 At around the 10km marker (run in just under 40 mins) was the first relay changeover point so the Winchester runner pulled away from me through the fields in the final few minutes. 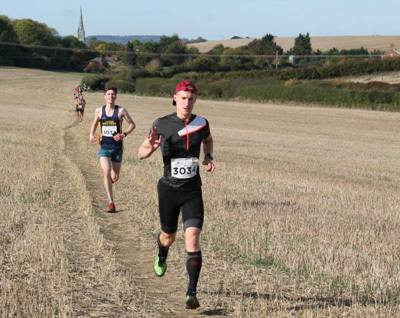 In the back of my mind had been the thought to try and keep up with him until the changeover just so I could be up in the lead at this point but sensibly I kept to my own pace as I’d just hinder my own race and get instantly passed by the next fresh runner. Appearing between hedges into the recreational ground there were plenty of people cheering us on while they waited for their relay runners to come in. I took the chance to slow down for a second, grab some water and a few jellybabies and be quickly on my way (a routine I’d follow at each of the relay changeover points). 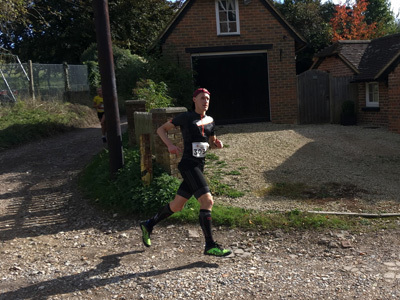 For the next two miles the course wiggled its way in and out of the village alternating between gravel and road sections allowing me see the gap that Lloyd from the Winchester relay team was opening up on me. Not long after that, I was passed by a very young Bea Woods, a refreshed second stage runner from one of the Andover relay teams. I gave her a bit of encouragement to catch up Lloyd a little further ahead, which she brilliantly managed to do by the next changeover. I wouldn’t see any other relay runners for a while but it didn’t mean it was a lonely run. Alongside the usual farmyard animals and small herd of alpaca, there were plenty of people I passed along the next few (very straight- it was a Roman Road after all) miles of the Clarendon Way- those who were intending to take longer than 5 hours to complete the course could set off an hour before me. This therefore gave me lots of opportunities to shout out a good morning and receive a well done in return. Alongside this the volunteers at regular intervals along the course meant there was plenty of support. The route continued eastwards towards Broughton on lumpy terrain- not too hilly to slow you down massively but just never flat and requiring a bit of effort to maintain your pace along the tracks and over tree routes. Approaching 20km (Around 1:20) in I was still feeling great, no problems with the calves and enjoying the sunlight and scenery along the way. Soon the route steeply dropped down the chalk tracks, onto tarmac and into Broughton where plenty of people could be found in the village, either getting to the 2nd checkpoint or warming up for the half marathon starting in around 20 minutes, following the final 13.1 of our race route. It was pretty busy again at the next changeover point in the village, with runners and supporters up against the wall of the Old Rectory. Out along the grassy fields at the edge of the village I passed through the halfway point in around 1:24. I was quite pleased with the time, not feeling any fatigue and the calves holding up well at this point. I’d been in a good rhythm for sometime now, not pushing hard, but not feeling slow. I knew the second half would be slower due to the hilly nature of the course so I was confident I’d be well under my pre-race target time. Between Broughton and Houghton the track rose a little offering a great view up ahead of the Hampshire countryside bathed in sunlight. It was a real pleasure running along the Clarendon Way that Sunday morning. Even better when you see a volunteer with a plate of sweets, although I did have to pause and pick out the ones I wanted: Wine gums yes, jelly babies no thank you. After a couple of miles fields and tracks the route passed quickly through Houghton and its lowest point where it crossed the River Test. 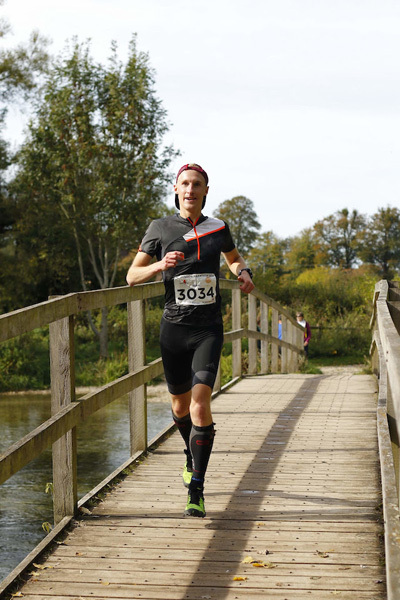 Along the gravel path and over a small bridge I was pleasantly surprised to see the familiar face of Graham Bungay from Totton Runners watching on and I exchanged a few words with him as I crossed the river. The route rose again soon after onto Cow Drove Hill, I was still moving well save for a few twinges in the calves. This was not entirely unexpected considering my niggles in the days before the race but the calf sleeves seemed to be doing the trick and helping keep them from tightening any further. 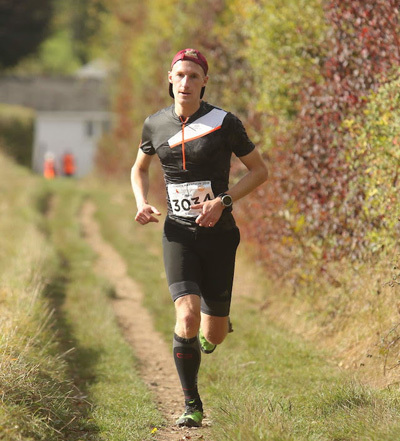 I’d kept on top of my fuelling (regular short sips of water at aid stations, a gel every 45 mins as well as the occasional handful of sweets) and felt like I had plenty in reserve for the final third of the race. Once again going up meant I was treated to another glorious vista of sunny skies, green fields and the hills up towards Farley Mount where I was soon to be heading for. I flew down Cow Drove Hill which is a steep descent into into King's Somborne (if you’ve ever ridden up this hill then you know how steep it gets). After a brief spell on tarmac through the village the race route turned off the road and began it’s most difficult section. Coming at 9 miles to go the climb up towards Farley Mount is a challenging one- just as you are starting to feel the miles in your legs you get just over 3 miles of off-road uphill paths to face which can really take the energy out of you even before you reach the dreaded 20 mile mark. I’d planned to be feeling as fresh as possible before the climb and was happy to be on plan at this point in the race. Luckily enough it wasn’t all uphill for the entire next 5 km, with the ups coming in 3 distinct sections between spells of flat or descent. Straight out of the village came the first part, know by runners as Killer Hill, a nasty 400m of steep uphill along the grassy edge of a field. Keeping tall, driving arms and legs hard I quickly dispatched the first difficulty passing some of the earlier starters walking up the hill. After reaching the top came a short grassy downhill, perfect for letting the heart and lungs recover a little bit before the next uphill. Whilst not as steep as the first section, the next mile was all uphill through a couple of copses and farm tracks. Since my previous visit in the summer the nettles and weeds had been trimmed back somewhat making it much quicker (and less stingy) section, maintaining a good rhythm while picking the past path. It would turn out that I was making pretty good time along this section, the fastest I’d run on these paths and extending the gap I had on those behind. I had hoped that some of the relay teams would have caught up to me around this point and give me someone to run off but it was just myself tapping out the miles at a consistent effort without going too hard that I’d suffer later on. The final push up to Farley Mount was about 3/4 mile, but included some really steep sections. Fortunately throughout this part I was rewarded with some great views of the area below. I even had a sneaky peak back down the tracks and didn’t see anybody at all so I knew I was still far ahead of anyone else. Having reached the top of the hill I continued on past the monument (dedicated to a horse named ‘Beware Chalk Pit’ bizarrely ), taking on my last gel and passing the last relay changeover point with just under 6 miles to go. Again there were a few friendly faces and shouts of support at the changeover point which also doubled up as a timing checkpoint for the marathon runners. 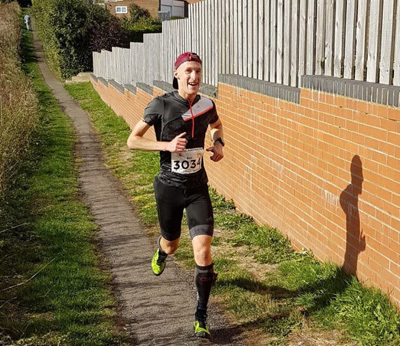 Although I didn’t know I had around a 6 minute gap at the time, I assumed I had a sizeable lead on everyone else and didn’t need to push any harder in the final miles. In the back of my head I knew I was more than likely going to win and finish under my target of 3 hours so I there was no real target to raise my effort for. Ideally I wanted to recover as quickly as I could before putting in a few weeks of training before Gosport Half Marathon in 6 weeks time. So I eased off a touch to help conserve my legs a little. 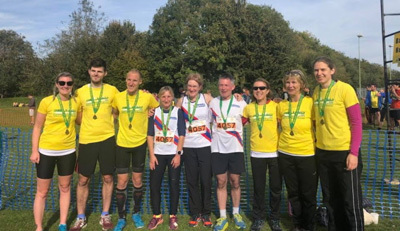 As the signs pleasantly ticked down the miles to go (6..5…4..) the route went in and out of a number of wooded enclosures that make up the Country Park, along a mix of gravel and grassy paths in order to reach the requisite distance before the finish on the outskirts of Winchester. On paper it doesn’t look too difficult but the path never really stays flat, swapping between slow drags uphill and steady descents. After nearly reaching the road (which would take you directly to the finish) the path deviated away again down another trail where I was finally passed by the third placed relay team- another quartet of Andover juniors. For a short time I tried to match his pace but with the legs feeling a little heavier (compared to his much fresher ones) now he steadily went away from me with under 5km to run. With 2 miles to go the path steadily rises again, up through some narrow tree lined sections. Some parts were tricky to keep your momentum on and I could soon see the next relay team runner behind me. As the path dropped and rose again I got out of his way as he was moving much quicker than me and would eventually catch the team ahead right on the finish line. This would be my slowest mile according to Strava’s Grade Adjusted Pace feature and proved a nasty sting in the tail. After a final short sharp climb up a narrow stone strewn gully I was back on much smoother tracks. I passed the Scout Campsite and the supporters there and moved back onto tarmac for the final mile. I relaxed and enjoyed the moment as the road undulated past the Golf Club towards Kings’ School. I took the final turn left onto Sarum Road and kicked on during that final quarter of a mile, wanting to see how quickly I could move my legs at the end. Up ahead I could see the finish on the field and enjoyed the last few metres and cheers as I crossed the line in 2:54. I was really happy in the end to sneak under 2:55, well under my target of 3 hours. Even more pleased (and relieved) was how well my legs (and calves) had held out and the knowledge that I could have run quicker. It had been a brilliant morning out on some beautiful trails on a lovely, sunny Autumnal day. 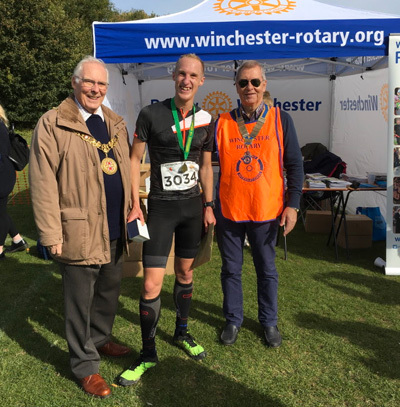 Shortly after finishing I was being congratulated by the Mayor of Winchester and given a couple of prizes for my win (including a free entry for the event next year as well as a meal for 2 in Kyoto Kitchen in Winchester). In the end I had around 11 minutes on the next marathon runner and was pleased that I’d only had a handful of relay teams pass me. There were plenty of people at the finish I chatted with, including some of the runners from the Lordshill teams eagerly waiting for their last runner to come in. At this point its worth giving a big round of applause to JJ Heath-Caldwell, the Rotary Club and all the other organisers and volunteers for making it all possible. The level of organisation, from the buses getting runners between the start and end locations, the volunteers encouraging all runners at every station along the way, to the number of events all starting in different places at different times is fantastic. Please do come and try this event out next year- Marathon, Relay, Half Marathon or even the Mini (5 mile)! Brilliant effort Ben and excellent story. We look forward to having you running with us again this year. For more info on Ben please visit his website.